Spiritual retreat in the UK is an easy and cost effective way, to recharge, relax and contemplate your life. You can come back from a spiritual retreat in the UK, calmer, wiser and with profound insights about your next steps. Furthermore, you don’t return with a big hole in your pocket: many of these retreats are low cost. When I need a break I love a spiritual retreat in the UK. Some people feel really uncomfortable being alone. Nevertheless, I have discovered that, once you break through any initial discomfort, a spiritual retreat in the UK is the perfect cure for loneliness or sadness. If you are a highly sensitive person, it may be that you actually need to spend time alone. A spiritual retreat in the UK is one way to make friends with yourself and get your sparkle back. If you want a spiritual retreat in the UK but you are feeling adventurous you can even organise your own mini-retreat. You can download a separate list of superb places of peace and power for independent free spirits! 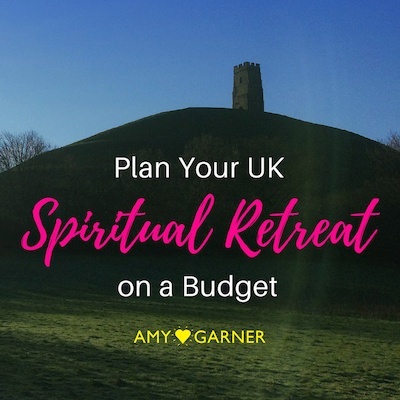 As well as the list in this blog, I’ve compiled a Plan Your UK Spiritual Retreat on a Budget guide (PDF). This booklet has 10 extra ideas for low cost UK spiritual retreats, aimed at the solo traveller. It includes travel information for those who don’t have a car and links. Sign up for instant access here! ​10 extra places of peace + power for the solo female traveller! ​Public transport info + links to ​places of interest. You don’t need to hop on a plane to India or Thailand for a spiritual retreat. It’s easy to plan a spiritual retreat in your home country. There’s loads of low cost retreat options in the UK, for example. A ‘home-country’ retreat is just as effective an antidote to fast-paced living as going to the other side of the world. It’s jet-lag free, can be spontaneous and it doesn’t have to cost a lot either. When you plan your spiritual retreat in the UK it means taking time away from your ordinary life and situation. Going on a spiritual retreat in the UK is better alone. If you bring an important part of your life with you then its not really a ‘retreat’. More of a holiday. A spiritual retreat in the UK offers the tranquility in which to ponder, reflect and connect with your inner life. It is a special time to give yourself some peace and calm. You might be stepping away from a hectic lifestyle full of being too busy. Or taking a much needed break away from the responsibilities: of children, pets, work or caring for someone. Perhaps you are escaping from a bad emotional situation in order to start the healing process. You may simply want some quiet and to be left alone for a day or two. No gossip. No grumbling. No meetings. No decisions. No interference. No push notifications. No ‘to do’ list. Spiritual retreat in the UK – what happens? “…You are faced with you alone. At long last! You begin then to slip into a slower physical, mental and emotional gear and start to think differently. Your body gears down. Your mind drifts from thought to thought. Slowly deep feelings arise. “Some may be good. Some may be bad. All of them are from within your interior world. All of them belong to you. What you do with them is up to you and a retreat is one of the best places to start to deal with what these feelings mean to your life. Their UK spiritual retreat centre Nuneham Park near Oxford enables guests to step away from the frantic pace of modern living; rediscover inner peace and power; restore balance and focus to life through solitude and silence; or study spiritual values. They offer one day or residential spiritual retreats in the UK. The University charges no fees for any of its activities, though voluntary contributions are welcome! Six centres for spiritual retreat in the UK, including Southwark, London (see map left). Tel: 01299 896345. Website: http://www.franciscans.org.uk/where-we-are/retreat-or-stay. Ideal for a private spiritual retreat in the UK, their Franciscan monastery at Glasshampton, near Shrawley in Worcestershire, offers solitude and spiritual direction too, if required. All people welcome. No charge but donations suggested. Totnes, Devon, UK. Tel: 01803 732661; web: http://www.sharphamtrust.org/The-Barn-Retreat. Non-denominational Buddhist spiritual retreat centre in the UK that promotes wellbeing and sustainable living on community, guided or solitary spiritual retreats. Visitors are expected to be part of the community during their stay. They do gardening and cooking in ‘mindful work’ periods. Meditation instruction is given. This spiritual retreat is from £190 per week. The Sharpham Trust has recently launched Sharpham House in Devon and was Number 1 in the best mind & body UK retreats by the Daily Telegraph. East End Road, Bradwell-on-Sea, Essex. Tel: 01621 776564; web: www.bos.othona.org. The Othona Community offers a place where different cultures and faiths discover how to live and work together. The purpose-built spiritual retreat centre in the UK is close to a nature reserve and has the use of the seventh-century chapel of St Ceed. Residential spiritual retreat prices from £38.00 per day (adult) at time of checking. Website: http://www.retreats.org.uk. This is a Christian association based in the UK aiming to “help people find ways of exploring and deepening their journey with God through spirituality and prayer.” They hold quiet days in various retreat centres in the UK. They also help with finding a spiritual retreat in the UK, offer advice on finding a ‘spiritual director’ and provide resources for your spiritual journey. Costs vary. An environmentally friendly farm that is part of the informal Eco-Psychology Network – people who are passionate about making a collective shift towards living sustainably. Though not technically a spiritual retreat in the UK, working weekends (WWOOFing) are available at low cost for those who appreciate the healing power of nature and communal living. It has organic vegetable, herb, and flower gardens, many native shrubs and trees, living willow structures, ponds, hens, ducks, sheep, an outdoor cooking area with clay oven. Accommodation includes chalets, caravans and farmhouse rooms. UK wide. Website: www.diggersanddreamers.org.ukIf you are able to make a longer term commitment and are happy to get involved with community life, you might be able to volunteer with a spiritual community. Though this is not a solitary spiritual retreat, it can offer a solution to people who want to get away and experience themselves in a new setting close to nature. The Noticeboard section of Diggers and Dreamers advertising volunteering positions, such as Othona West Dorset, Pendragon Community Glastonbury and The Abbey Retreat Centre in Oxford. Some requirements include: a desire to live in community, mature outlook, self awareness, sensitivity to others, flexibility and adaptability, enjoyment of working in a team, being on a spiritual journey, possessing good health and an open-mind. Abbey House is a stunning venue for a spiritual retreat in the UK. It welcomes people of all faiths and paths. This spiritual retreat is set in the magnificent and historic grounds of Glastonbury Abbey, Somerset, UK. The retreat centre offers a secluded, peaceful spiritual retreat for those in need of relaxation and spiritual nourishment. Famous for it’s hospitality and good food, they cater for both group and individual spritual retreats. B&B from £48 per night for individuals. Shropshire, UK. Website: http://www.taraloka.org.uk/. Spiritual retreat centre for women. Spiritual retreats range from introductory weekends through to two week intensive spiritual retreats. They run on a ‘Dana’ basis (no set fees), as they want all women to be able to go on a spiritual retreat in the UK and learn about meditation and Buddhism, regardless of their financial situation. Donations are welcomed, starting at £50 for a weekend and £70 for a longer retreat. Anam Cara spiritual centre is set in the beautiful wilderness of the highlands. It has been developed as a way of life as opposed to a business. It’s name is a symbol for the ‘circle of belonging’. The centre’s activities and trainings promote inner friendship and embrace nature, divinity, spirit and human world as one entity. It offers working retreats from as little as £50.00. Concession rates (20% discount) on other trainings are available for unemployed and low waged. Please enquire. Shambala Retreat Centre is a renovated country house, set in six acres of quiet and secluded grounds near Inverness. Part of the Findhorn Community, it offers meditations, retreats and courses. It is space for individual reflection and contemplation. Findhorn is a very beautiful area (see below). Costs vary. The Park is a very magical community and magical things happen here. The landscape is like Tove Janssen’s Moomin-land. Regular retreats available, such as Detox and De-Clutter Your Life – A Raw Food Diet Retreat. But this place ain’t cheap so if cost is an issue then I suggest staying at nearby Shambala and dropping into Findhorn as a day guest for specific events and meal times. See the best mind & body UK retreats by the Daily Telegraph. The Good Retreat Guide by Stafford Whiteaker (published by Hay House, £9.79). It is an excellent guide to the best spiritual reteats in the UK and worldwide.